A: The pigments simply need to be mixed with molten beeswax, in order to create your own encaustic color blocks. The ratio of pigment to wax depends on the pigment tinting strength and the opacity. 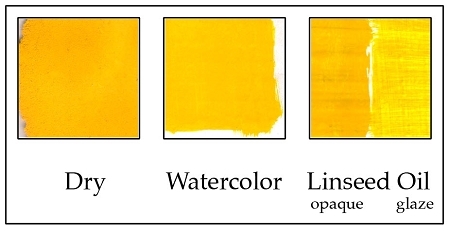 For example, this Hansa Yellow has a high tinting strength and therefore only a small amount of the pigment would be required to tint a large amount of beeswax. A 20g jar should be more than enough for a pound of beeswax. For tinting strength information on other pigments, simply click on our individual pigment listings and the tinting strength will be listed in the description. Q: What is the color index? Is this color lightfast? Is this a granulating pigment? Is this non-toxic? Is it staining? A: The color index number is PY0741. This pigment loves to lump up in water, unless it is dispersed with a small ratio of denatured alcohol in the dispersing water. It is classified as non-toxic, since it does not contain any heavy metals. It is not water-soluble and therefore can not stain. Q: Is this pigment lightfast? A: All of our pigments are lightfast. Q: Please indicate COLOR INDEX name on your pigments. I advise my students to NEVER buy pigments if they do not know the CI name. Knowing the CI name allows them to refer to the ASTM standards for lightfast ratings. What is the CI name of DC0741 Brilliant Yellow (Hansa) Warm Primary Yellow? A: Hansa Yellow is a rather standard color and most artists know it as PY0741. We always advise our students NOT to paint by the numbers.